Seemingly due out on February 14, 2019. 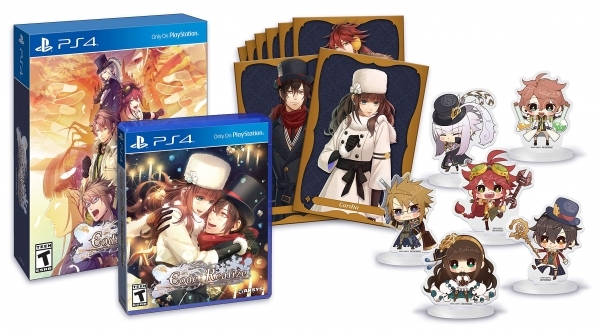 Aksys Games will release a limited edition for Code: Realize ~Wintertide Miracles~ in North America, Amazon listings (PlayStation 4, PS Vita) reveal. The limited edition will include a copy of the game on either PlayStation 4 or PS Vita, six three-inch acrylic figurines featuring chibi artwork of the characters, and eight four-by-six-inch over-sized character cards packaged in a collectible box. Made by the masters of the otome genre, Idea Factory and Design Factory, Code: Realize ~Wintertide Miracles~ continues the adventures of the poison-skinned maiden Cardia and a selection of famous (and famously handsome) figures from western literature as they face new challenges, new friends and foes, and new opportunities for love. Triangulate – Experience the magic and chaos of a two-on-one date. Play with dynamics (and hearts) by bringing multiple members of Lupin’s gang on a wide variety of romantic romps. Every End Has a Beginning – Learn more about the dashing detective Herlock Sholmes and the mysterious Finis in the continuing sagas involving the newest men in the Code: Realize universe. View images of the game’s box art and limited edition at the gallery.